Featured amenities include express check-out, dry cleaning/laundry services, and a 24-hour front desk. This hotel has 3 meeting rooms available for events. Free self parking is available onsite. 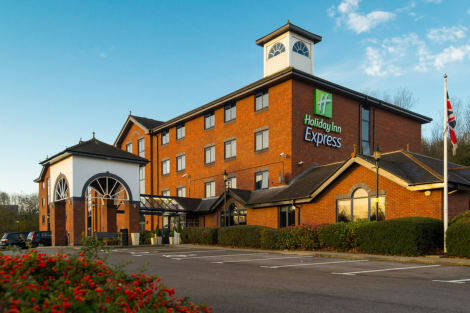 An inviting hotel with free parking, free Wi-Fi and easy access to Stafford and the M6Holiday Inn Express® Stafford hotel places you just moments from the M6 motorway.A short drive takes you to Stafford town centre, where Stafford Railway Station offers direct trains to Birmingham and London. Local buses run to Stafford from a nearby stop. Birmingham Airport (BHX) is a 40-minute drive. A short drive from the hotel, the ruins of Stafford Castle, more than 900 years old, stand on a hilltop with sweeping views. A 15-minute drive takes you to Cannock Chase, where you can enjoy a woodland stroll. Nearby, Shugborough Estate includes a Georgian mansion, a walled garden, and vast parklands. For family fun, Alton Towers theme park is a 45-minute drive. Travelling for business? Corporate guests can host functions for up to 35 people in the hotel’s 3 naturally lit meeting rooms. Ask our friendly staff about arranging catering to suit your needs.At this hotel you can enjoy:- Free Wi-Fi- Free parking- All Day Dining- Express Start™ Breakfast included in the room rateComfortable rooms come with pillow menus and blackout curtains to help you get a good night’s sleep. Family rooms include sofa beds. Start your morning with a generous breakfast buffet. Evenings, you can relax in the bar with a glass of wine or a pint. Located in Stafford, Wyndale Guesthouse is minutes from Stafford Gatehouse Theatre and St Chad's Church. This guesthouse is within close proximity of Stafford Castle and Ancient High House.Rooms Make yourself at home in one of the 8 guestrooms featuring DVD players. Complimentary wireless Internet access is available to keep you connected. Partially open bathrooms with showers feature complimentary toiletries and hair dryers. Conveniences include coffee/tea makers, and both irons/ironing boards and cribs/infant beds are available on request.Amenities Make use of convenient amenities, which include complimentary wireless Internet access and tour/ticket assistance.Dining A complimentary full breakfast is included. Wrap up your day with a drink at the bar/lounge. Continental breakfasts are available for a fee. Stafford is the historic county town of Staffordshire in the West Midlands of England, some 24 miles north-west of Birmingham. It is thought that Stafford was founded in about 700AD by a Mercian Prince named Bertelin. The town has a richness of historical landmarks. Perhaps the most prominent is Stafford Castle, two miles west of Stafford and an important Gothic Revival Keep. The building you can visit today sits on the foundations of its medieval predecessor and indeed uses much of the original stonework. The very first structure here was a classic wooden motte and bailey style development, dating from the Norman period, and some of the fort's defences can still be seen. This timber and earth fortification was replaced by a stone-built castle in the 14th century, which was in turn demolished during the English Civil War by victorious Parliamentarians after a ferocious siege. The castle was left in ruins until rising again from 1813 in the grand Gothic Revival Style, although work was never fully completed due to lack of funds. The keep was occupied until well into the 20th century before once more falling into disrepair, until the 1970s when archaeological excavations began to reveal the layers of important history and habitation. In the 1980s a proper heritage trail was established with a dedicated museum and gift shop, so that today it a flourishing visitors attraction and summer venue for Shakespearian performances. 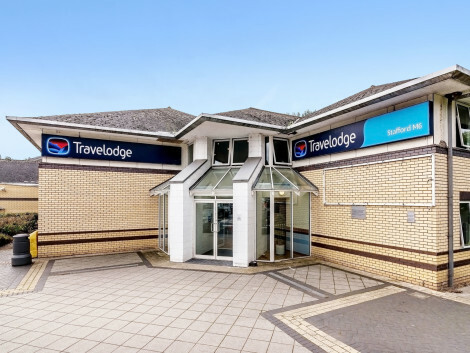 From Stafford hotels you can enjoy the Elizabethan Ancient High House, which is the largest timber-framed town house in England and an excellent museum. The oldest building of all in the town is St Chad's Church, dating back to the 12th century. This is a richly decorated church with some very fine carvings, which may have been made by stonemasons from the Middle East who came to England during the crusades. Like so many of Stafford's architectural highlights, it's well worth exploring. Nearby you can enjoy the glorious Shugborough Estate. Set in 900 acres of peaceful parkland and riverside gardens, with an elegant mansion house at its heart, the whole estate is brought to life by costumed ‘living history' characters. Explore working Victorian Servants' Quarters, a Georgian farm, dairy and mill, plus a lovely restored walled garden. Highlighting very different times, the Royal Air Force Museum Cosford houses one of the UK's largest aviation collections in two awesome wartime hangars and in the fascinating National Cold War Exhibition. Outstanding features of this excellent museum include the three V-Bombers, the Vulcan, Victor, and Valiant, and the world's oldest Spitfire. There's good food, snacks and drinks to be had both in the Refuel Restaurant and Checkpoint Charlie Café. Papers don't have to be shown to gain entry!